And, while the concepts of trees scrubbing the air and cleaner air having beneficial effects are not particularly new, “the innovation derives from linking pollution removal by trees to human health in cities,” said Dr. David Nowak of the US Forest Service, and one of the authors of the studies. “We know the existing forest is already removing air pollution, but better designs and management could be used to produce further air quality improvements using trees and forests. This, in turn, would improve human health and significantly reduce associated health care costs,” he said. “Computer simulations with local environmental data reveal that trees in 86 Canadian cities removed 16,500 tonnes of air pollution in 2010, with human health effects valued at $227.2 million Canadian dollars,” said Dr. Nowak. In an earlier study of U.S. trees and forests nationally, again using 2010 as the base year, human health effects were valued at US $6.8 billion, and 17.4 million tonnes of air pollution were removed. The Canadian government – Environment and Climate Change Canada – helped fund the more recent study (Air pollution removal by urban forests in Canada and its effect on air quality and human health) shortly after the 2014 publication of the assessment for the U.S. done by Dr. Nowak and his colleagues. “All countries could use and benefit from this type of information,” Dr. Nowak said. “The processes of trees are fairly consistent across the globe, but the results will vary based on local environmental conditions and human and forest populations. “A series of free tools is available to aid cities and forest managers globally in assessing their current forest structure and benefits (www.itreetools.org). We’ve now incorporated this particular process into the i-Tree Eco model to help managers estimate these and other effects and values from trees and forests,” he said. Since its release in 2006, there have been over 247,000 users of i-Tree tools in 131 countries. i-Tree is a state-of-the-art, peer-reviewed software suite from the Forest Service of the USDA that provides urban and rural forestry analysis and benefits assessment tools. The i-Tree tools can help strengthen forest management and advocacy efforts by quantifying forest structure and the environmental benefits that trees provide. Since the initial release of the i-Tree tools in August 2006, thousands of communities, non-profit organizations, consultants, volunteers and students around the world have used i-Tree to report on individual trees, parcels, neighborhoods, cities, and entire states. By understanding the local, tangible ecosystem services that trees provide, i-Tree users can link forest management activities with environmental quality and community livability. 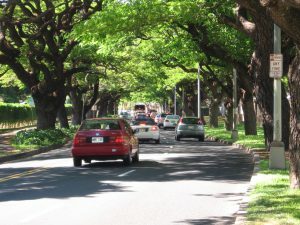 Dr. Nowak pointed out that trees provide multiple benefits in addition to pollution removal, so it follows that better urban forest design and management, in addition to improving human health and lowering health-related costs, could also reduce other urban problems and costs, such as energy use, flooding, high air temperatures, etc. “If better forest designs and management are instituted to improve air quality, people living in cities everywhere should benefit,” he continued. “Even though the percentage of air quality improvement is relatively small, these improvements in air quality impact human health,” said Dr. Nowak. “Cities are not just people, buildings, roads and cars. They also have substantial amounts of natural elements such as trees, grass, soil, wildlife etc. that play essential roles within city environments,” he said. Cities would have to assess their current forest distribution and conditions. With that information and knowledge of tree effects on air pollution, specific management plans could be developed to maximize tree impacts on human health. Policy makers, he said, should recognize that trees and forests within cities affect air quality and can be used to further improve that air quality. Investing in improving city forests and their management can yield improvements in human health and wellbeing and save money in the long run. Dr. David Nowak is the coordinator of IUFRO Research Group 6.07.00 – Urban forestry: https://www.iufro.org/science/divisions/division-6/60000/60700/.